It’s been a bizarre, severe winter in nearly every corner of Canada, and for many communities, that means potholes. And more potholes. And yet a recent Kal Tire survey shows while 72 per cent of motorists have hit a pothole, only half with pothole damage have had their vehicle fixed. What does that mean for driver safety? How much damage can potholes do to vehicles anyway? 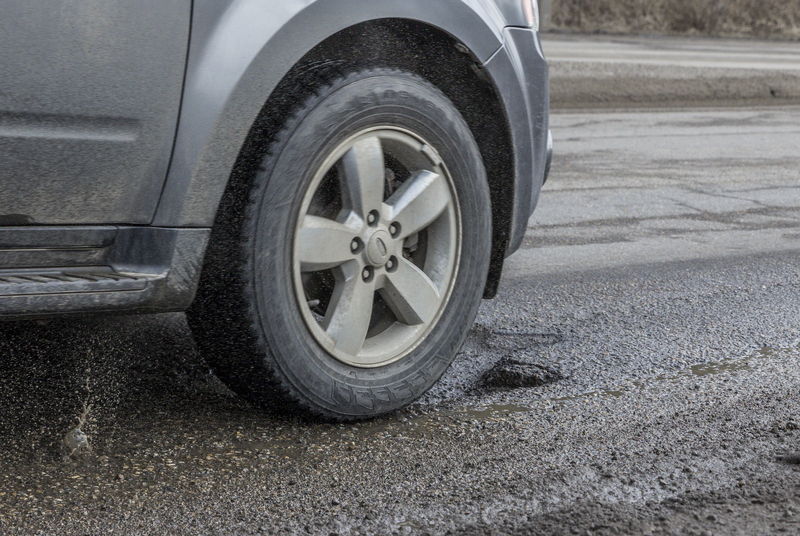 What do Canadians know—or not know—about pothole vehicle damage risks? In the thick of Canada’s pothole season and to help educate drivers, Kal Tire set out to share the answers to these questions. 1. How does pothole damage impact vehicle safety? Even if your wheels become bent only slightly, it can lead to poor seals between the rim and the tire, which can lead to leaks and flat tires. Wheel damage can also cause vehicle shaking as well as reduced handling, steering and poor braking performance. In this fantastic video by Mike Granek of Top Daddies.com, his interview with automotive expert Bill Gardiner begins with an explanation of the impacts of wheel damage. Even a single dramatic pothole damage impact, or minor repetitive ones, can cause suspension issues that impair the vehicle’s ability to steer, absorb and dampen shock, maintain road contact and support the vehicle’s weight. Misalignment can cause poor steering, irregular tire wear and vibrations that lead to driver fatigue. Learn the three signs you need an alignment, and how Kal’s technology and technicians ensure all four wheels are parallel and sitting flat on the road, and that your steering wheel is centered. Other systems, areas and components that can be affected by potholes include scratched undercarriages and ball joints. 2. 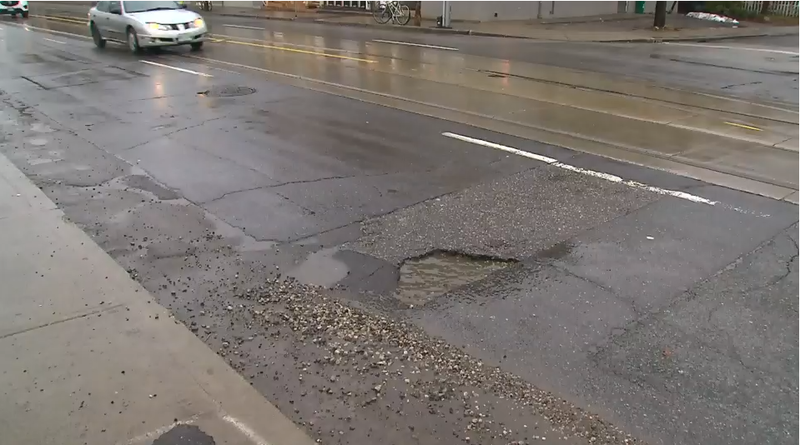 What do Canadians know and do about pothole damage? Kal Tire’s pothole survey, which polled more than 1,000 Canadians from BC to Ontario, offered some interesting insight into how drivers experience and react to pothole vehicle damage. 40% of motorists who have hit potholes this winter say that it damaged their vehicle. The most common damage was to alignment (39 per cent). 32% of motorists with damage reported their steering started pulling to one side, and or that the impact damaged their wheel rims (11%). For vehicles that sustained alignment damage, only 44% of drivers have had it fixed, many motorists left damaged undercarriages, shocks and struts as is. Other problems caused by potholes include vehicles vibrating, shaking or wobbling (37%), damage to undercarriage (28%), vehicle bouncing/swaying (22%), flat or damaged tires (17%), body dents (14%), leaking fluid (4%). 3.What can you do to reduce the impact of potholes? There are ways to help reduce the amount of damage and safety risks associated with potholes. Watch this video by CTV Toronto’s Pat Foran to find out what you can do. fig. Click the pothole to see Pat Foran of CTV talk about potholes. Help your vehicle recover from pothole damage and prepare for safe spring driving! Book an inspection at one of our Kal Tire locations near you!